Are you seeking a way to add static pages for your blog? Yeah, that could be the exact reason you are reading this post. You might be wondering how other bloggers able to show off Contact page with their respective contact information or About page which includes information about contributors and who behind the blog. They are different from publishing regular posts on your blog. In addition to publishing posts or stories, Blogger allows you to publish information mostly native to your blog in a quite distinctive way. So would you like to know how to create standalone pages on your blog too? 3. Navigate to Pages tab. 4. Click on New page drop down button. 5. Now either select Blank page or Web address option. Blank Page - You can create you own static page on your blog by adding text or media as like as you write a new post. Web Address - You can redirect users for external web page which might interest them. 6. If you selected Blank page, add up your content in post editor and save the page. Else if you selected Web address, specify the URL or web address you wanna direct users and save it. 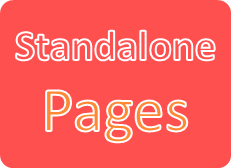 * If you are need to display standalone pages you created on your blog, read How to Display Your Standalone Pages in Blogger. Please help me how can customize page url for blogger site. My Existing page url look like as www.mysite.com/p/page-title.html. if yes then please guide me. Currently Blogger doesn't offer you a way to change whole URL mate. Recently Blogger started out with Permalink feature where you can change URL of the page but not completely. And yet it's not available for all users. You can refer it here ~ Create Custom Permalinks for Blogger Posts. However yet you can't change URL exactly as you intend here in Blogger. Can I make a page with a bunch of videos, or will I have to do them individually? Yes you can mate :) Just need to add up video embedding code on your pages. Or if your video hosting service supports playlist or kind of thing, you can embed playlist at once so users can watch it all in same space.